Did you ever want to know the story behind Linsanity? 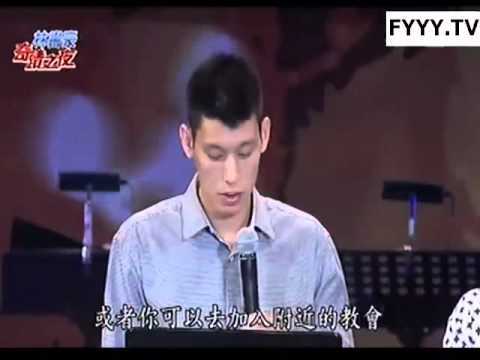 Last week, Jeremy Lin gave his testimony/sermon about his life and Linsanity in Taiwan before thousands of people at Xinzhuang Stadium. Even when things in his life seemed bleak when he was sent to the D-League multiple times and was waived by several teams including his home team the Golden State Warriors, he shared about how God’s hand has helped him along the way with a plan for him. Jeremy had a lot of doubt about his purpose and playing basketball in his rookie season. Stressed physically and emotionally during that time, he reached a point of depression, feeling embarrassed and a complete failure. At his deepest point, he lacked confidence on the court and didn’t like playing basketball, even wishing he never signed to the Golden State Warriors. After his rookie season, he changed his perspective and decided to play ball for God and no one else. 5.Entered NBA draft (his best work out with Knicks, but they took Landry Fields), but Lin went undrafted. 7. Teammate “Roddy” Beaubois got injured (that was the only game he missed in summer league) which gave Lin play time. Of the 20 quarters of summer league, Jeremy’s best was the 4th quarter against Wizards. During that day, Lin was known for his skills against the Washington Wizards 2010 #1 draft pick John Wall. 8. Houston Rockets picked up Lin in 2011. The team had 15 players on roster, Houston wanted to keep Lin and for 2 days tried to trade away another player to keep him, but he was waived on Christmas Day. 13. Landry Fields (the one that took his spot in Stanford and the Knicks) became his closest friend in NY during Linsanity. He worked closely together as teammate and even had a secret handshake. Without these things, Linsanity wouldn’t have happened. It’s Romans 8:28 in action. Even with all the success from benchwarmer to starter, Jeremy Lin wasn’t fulfilled and wanted more. With magazine and TV coverage, he had it all along with endorsement deals and a win streak, but things slowly faded away. By March 11, 2012, he was too focused on stats, wins, and Linsanity. With the miraculous run over, he felt a loss of joy and emptiness. Lin needed to refocus and play for God again and not for himself or everyone else. best in field, from there you want cars, home, & gadgets, to spouse and family/kids. Then you want the kids to jump in the same cycle, so the next generation can get more. You always want more. Can you ever feel satisfied or fulfilled? This entry was posted in sports on September 10, 2012 by Kevin Hsieh - channel APA. Everyone of us is like a living bible, so let’s be humble and proud in Jesus Christ, keep praying for Jeremy Lin in every aspect and for ourselves, too.